The "Pirate Discovery" app was created for the fourth installment of the Pirates of the Caribbean franchise. Besides getting movie clips, photos, actor bios, and showtimes, fans were taken on a virtual treasure hunt with real treasure waiting for them at the end of their quest. The app was built exclusively for Verizon Wireless and one of the requirements was that it had to work on all their existing and soon to launch Android phones and tablets. Special attention was paid to how the app would look and scale on different screen sizes, resolutions and pixel densities. Many of the assets were designed for the largest screen sizes and we cropped off pieces or overlapped elements on the smaller screens. Wireframes and flow diagrams were quickly created to work out any user interaction issues we might have with an app that was both a game and an informational movie app. The wireframes served as a foundation for the final designs and freed us up to spend more time on refining the small design details and keep the final app size as small as possible. The game aspect involved physical location checkins, the first commercial implementation of a new "Video ID" technology from Videosurf, a reward store and movie trivia questions and answers. The movie app showed POTC4 showtimes by gps location, character bios, exclusive movie artwork and concept art as well as behind the scenes videos. The total size of all the app graphics were kept under 2mb by creating a key asset file. We build this file after the first couple of screens were made and it insured that we reused as many of the UI and graphic items as possible. Because the number of assets for the app were minimal, we were able to pack a large amount of detail to each item, creating a level of detail not seen in Android apps at that time. We worked through a bunch of variations of the App Icon but after testing out the designs on different screen sizes and background colors, we decided on the torn map with the name Pirate Discovery written on it. 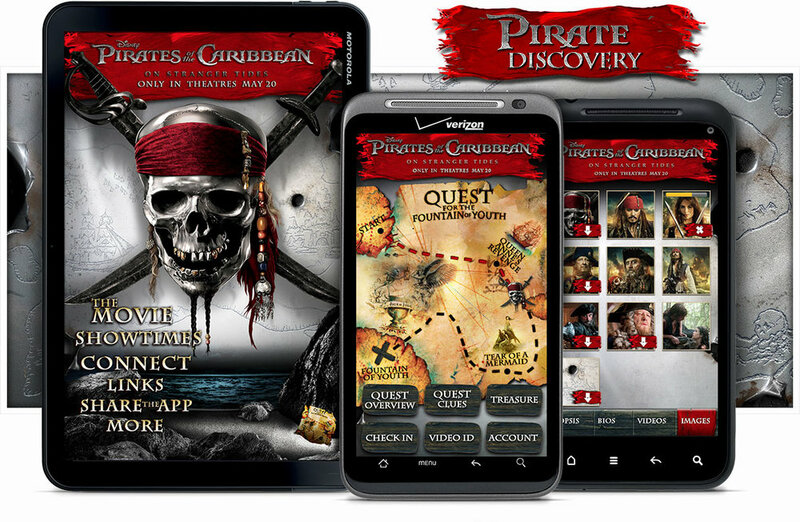 The "Pirate Discovery" app had its own commercial that was shown nation wide on cable television. I didn't work on this video, but it was fun to see an app I designed being shown on my TV. I think the parrot was impressed as well.